Facial cleansing wipes are probably my favourite way to remove makeup. Convenient, easy to use, and if they're good, they will remove ALL the makeup off in no time. I haven't met a makeup cleansing wipe I didn't like. They all do such a great job at removing my makeup, from layers of foundation to long lasting lipsticks and anything waterproof. And bonus points for not irritating the skin and keeping moisture in the skin instead of striping it away. Vichy Purete Thermale Micellar Cleansing Wipes is your one-step cleansing solution that gently removes impurities and makeup from face, eye and lip, even waterproof makeup. No rinse needed. The formula, enriched with Vitamin E, soothes and refreshes skin. Skin feels softer and more comfortable. The Vichy Purete Thermale Makeup Removing Miceallar Cleansing Wipes come in a decent size - one towelette managed to clean off all the makeup on my face. However, on a day where I'm wearing a heavier amount of makeup, I would use two towelettes. The towelettes are not super soaked but leave a clean feeling from the micellar water. These scentless wipes are not only gentle on the skin and left my face feeling clean but also smooth, refreshing, and didn't leave a sticky feel on the face. When it comes to my skincare, no matter how tired I may be at the end of the day, I don't strictly rely on a makeup removing wipe and go to bed. I do go through a full skincare routine and the wipes simply ensures me that all my makeup is completely removed before heading into the next steps. At the end of the day, if you're someone who is looking for a quick makeup removing solution, these Vichy wipes are right up your alley! 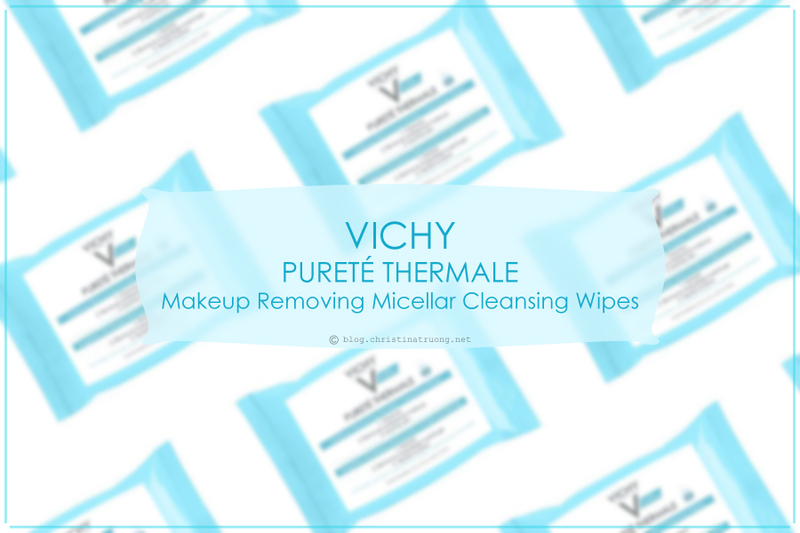 What are your thoughts on Vichy Purete Thermal Makeup Removing Micellar Cleansing Wipes? Have you tried Vichy products before? Do you have a favourite product for removing makeup?